Here are some places to see work by Randolph Caldecott. A separate page mentions places where he is remembered by plaques or memorials. Watercolour sketch for "A Frog he would a-wooing go" (1883): click here. See also Randolph's last picture: click here. Print Rooms opening hours: Tues-Sat, 10:00-16:30 (but last requests must be made by 15:45). Even when open normally, they are closed throughout September & 1st week in Oct each year for stock-taking. Admission charge to Museum: currently (at Oct 2003) free. Some exhibitions and events carry a separate charge: see their main Website (below) for latest rates & concessions. and search by Name for "Caldecott, Randolph". Some items may be at a different address: the Beatrix Potter Study Room, Book Trust, 45 East Hill, Wandsworth, London. See Website for opening times and access details. For Supplementary Catalogue of Caldecott items in the V&A's Renier Collection, click here. 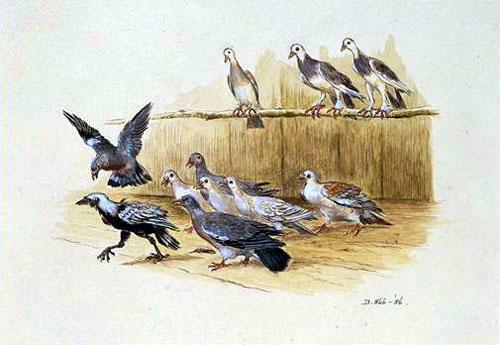 Randolph Caldecott worked as a Bank Clerk in Whitchurch before devoting himself fully to Art. The Heritage Centre has an excellent display about him, with some of his works, interactive exhibits and prints for sale. Admission is free. Open: Mon-Thu 9:00-17:00, Fri 9:00-16:30, Sat 10:00-17:00. Closed Sundays. Phone: (01948) 665 432 or 664 577. Also at Whitchurch is St. Alkmund's Church, visible in the background of Randolph's picture of Whitchurch High Street in the Picture Book The Great Panjandrum Himself. Some High Street shops are in the "She-Bear" picture from the same book: click here. About a mile from Whitchurch is Hinton Old Hall, depicted by Randolph in "Caldecott's Collection of Pictures and Songs". Also close to Whitchurch is Wirswall, where Randolph lodged while working for the Whitchurch & Ellesmere Bank in Whitchurch. Example: "Ceremony of removing a piece of sculpture from the British Museum" (drawing, black chalk). Shows two workmen carrying a litter, in which a small marble fragment lies on a cushion, watched over by an official (Sir C T Newton, KCB), who walks beside down a corridor of mocking statues. Bought by the British Museum in 1886. These drawings are not on view, but can be examined in the Students' Room. This reopened on 22 Jan 2001. Opening hours thereafter: Mon-Fri: 10:00-13:00 & 14:15-16:00; Sat 10:00-13:00. Admission: free, but donations welcomed. (Sources of info: Jenny Ramkalawon, Curator, Prints Dept, Jan 2001; Martin Royalton-Kisch, Senior Curator, Oct 2003). 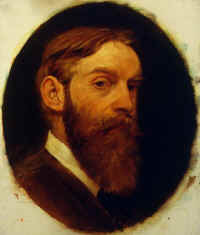 Self portrait by Randolph Caldecott. One of a Collection of self-portraits by successful artists, donated to the Gallery by Lord McDonald. A significant Collection of Randolph Caldecott's works and papers is held at this Museum, but most items are not currently on display. To see or study them, contact the Curator before visiting. Don't confuse this with "Worcester Art Museum" in Massachusetts, USA! They hold the original Printing Blocks of "The Milkmaid", plus 24 items relating to Edmund Evans, the engraver and printer of so many of Randolph Caldecott's best-known works - including Evans's "reminiscences". Library Hours: Tuesday 12.00–5.30pm, Wednesday 12.00–9.00pm, Thursday 12.00–5.30pm. To email the Library: use the form on their website. Plate from "The House that Jack built" . a very small one (21 x 30 cm) called The Girl I Left Behind Me . This Gallery had a Christmas Exhibition about Randolph Caldecott, with examples of his work, 13 Dec 1977 - 28 Jan 1978. This Exhibition included a rare appearance of Randolph's sculpted cat, loaned from the V&A. Also shown were in-situ pictures of decorative panels painted by Randolph for Mr Renshaw's house in Buxton, Derbyshire: sadly, since the Exhibition these have been sold and we don't know their whereabouts today. Copies of the Catalogue, though long out of print, may still surface occasionally. Opening hours: Tues-Sun 10:00-17:00. Closed Mondays except Bank Hols. The Colin Mears Collection includes a number of Randolph Caldecott's books, including Jack and the Beanstalk by Hallam Tennyson, illustrated by Randolph Caldecott. - see next page: click here or on the "Memorials" button below. This list is not comprehensive, but will be added-to. If you know of other relevant exhibits or places, please Email us with details at the address at the bottom of this page.